How can I do different calculations on different sets of data? To be able to use the split-apply-combine strategy for data analysis. # with the GDP per capita column. A common task you’ll encounter when working with data, is that you’ll want to run calculations on different groups within the data. In the above, we were simply calculating the GDP by multiplying two columns together. But what if we wanted to calculated the mean GDP per continent? But this isn’t very nice. Yes, by using a function, you have reduced a substantial amount of repetition. That is nice. But there is still repetition. Repeating yourself will cost you time, both now and later, and potentially introduce some nasty bugs. We could write a new function that is flexible like calcGDP, but this also takes a substantial amount of effort and testing to get right. We want to split our data into groups, in this case continents, apply some calculations on that group, then optionally combine the results together afterwards. For those of you who have used R before, you might be familiar with the apply family of functions. While R’s built in functions do work, we’re going to introduce you to another method for solving the “split-apply-combine” problem. The plyr package provides a set of functions that we find more user friendly for solving this problem. Apply a function on each split in turn. Recombine output data as a single data object. 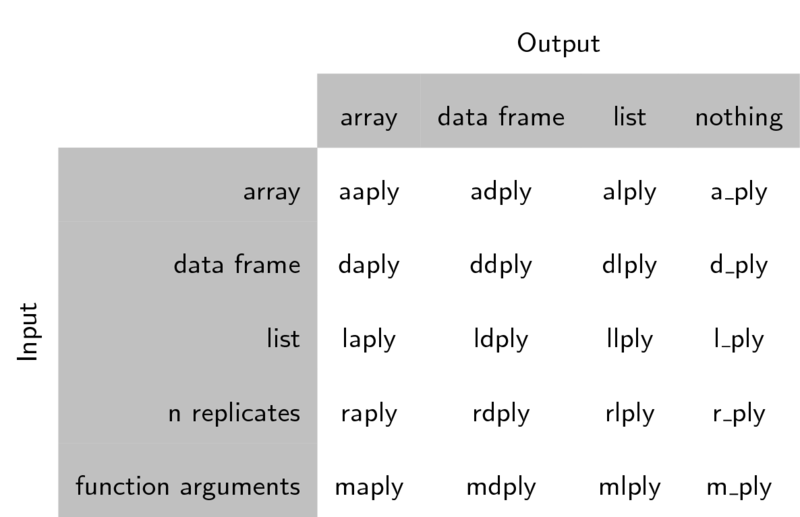 The functions are named based on the data structure they expect as input, and the data structure you want returned as output: [a]rray, [l]ist, or [d]ata.frame. 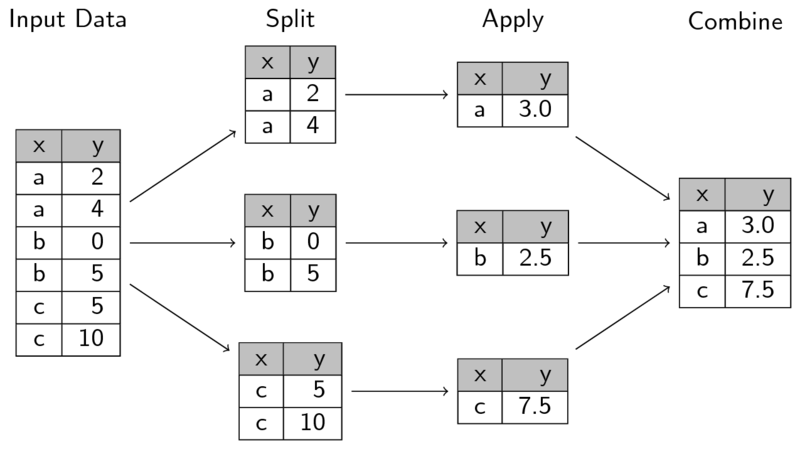 The first letter corresponds to the input data structure, the second letter to the output data structure, and then the rest of the function is named “ply”. Note here that plyr’s use of “array” is different to R’s, an array in ply can include a vector or matrix. The first letter of the function name gives the input type and the second gives the output type. the first argument we gave was the data.frame we wanted to operate on: in this case the gapminder data. We called calcGDP on it first so that it would have the additional gdp column added to it. The second argument indicated our split criteria: in this case the “continent” column. Note that we gave the name of the column, not the values of the column like we had done previously with subsetting. Plyr takes care of these implementation details for you. The third argument is the function we want to apply to each grouping of the data. We had to define our own short function here: each subset of the data gets stored in x, the first argument of our function. This is an anonymous function: we haven’t defined it elsewhere, and it has no name. It only exists in the scope of our call to ddply. Calculate the average life expectancy per continent. Which has the longest? Which had the shortest? We called the same function again, but changed the second letter to an l, so the output was returned as a list. You can use these functions in place of for loops (and its usually faster to do so). To replace a for loop, put the code that was in the body of the for loop inside an anonymous function. "The mean GDP per capita for Africa is 2,193.755"
 "The mean GDP per capita for Americas is 7,136.11"
 "The mean GDP per capita for Asia is 7,902.15"
 "The mean GDP per capita for Europe is 14,469.48"
 "The mean GDP per capita for Oceania is 18,621.61"
The format function can be used to make numeric values “pretty” for printing out in messages. Calculate the average life expectancy per continent and year. Which had the longest and shortest in 2007? Which had the greatest change in between 1952 and 2007? Calculate the difference in mean life expectancy between the years 1952 and 2007 from the output of challenge 2 using one of the plyr functions. Use the plyr package to split data, apply functions to subsets, and combine the results.